Frontlines of different periods. Red lines - old roads, dash lines - railroads. 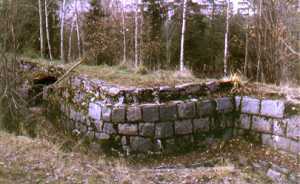 First fortifications around the Helsinki were temporary field fortifications. Banks were built on the high hills using sand, stones and soil and small pits were made into the bank for machine guns. Artillery batteries were temporary field batteries. Therefore there are no batteries left from that fortification period. Twenty batteries were planned to built around the city. Strongest guns were planned to be 229 millimeters (9") artillery type mortars. After the strategic importance of Helsinki was increased Russians decided to give up the line which started year 1914. It is unclear how many of those planned batteries were built. 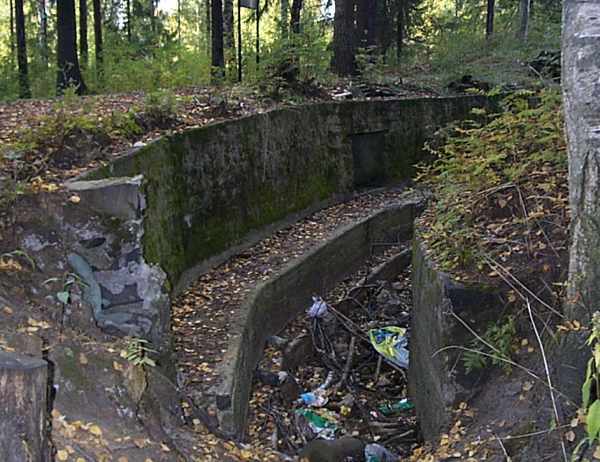 In the beginning of year 1915 Russians decided to build more fortifications further from the city. Soon it was also realized that fortifications should be stronger and made for permanent use. Wood and stone blocks were the most important building materials before implementing the use of concrete. In the end of year 1915 there was a resolution to built third defense line on the northern and eastern side of the fortress. Building of that line was started probably in the beginning of year 1916. The bases were completed gradually. Plans and constructions developed during the war. In the philosophy of fortification the work never end, defense lines can strengthen more and more. During the war, more attention was paid to build stronger firing positions and shelters. Last constructions which were built in the end of the war were strong systems with several meters thick concrete roofs. When the Russian revolution 1917 almost interrupted work on the fortress there were just few unfinished bases. Working on some building sites were continued to the beginning of year 1918. Krepost Sveaborg divided into a land front and a seafront. Year 1916 the land front divided into three sectors: eastern, northern and western fronts and the land front consisted of 36 bases. There were more or less 55 batteries (exact number cannot be found out anymore) with about 200 cannons.